The Queen's first cousin and one of her most trusted confidantes, Margaret Rhodes, has died aged 91. 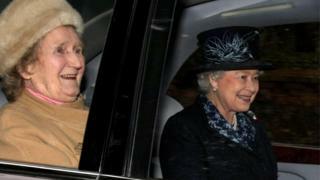 Mrs Rhodes, whose aunt was the Queen Mother, died on Friday after a short illness, according to reports. A spokesman for Buckingham Palace said it was not issuing a statement as it was a "private matter" for the Queen. Mrs Rhodes, who was less than a year older than the Queen, spent her summer holidays at Balmoral with the Princesses Elizabeth and Margaret. Speaking to the BBC earlier this year, ahead of the Queen's 90th birthday, Mrs Rhodes repeated her belief that the monarch will never abdicate while she has her health. Mrs Rhodes said: "Her total dedication is something we should all be grateful for." Margaret Rhodes was a delight to interview. She was direct and honest - perhaps too direct and too honest for the more sensitive souls who reside at royal palaces. At the height of the hype generated before Prince George was born, CNN's Christiane Amanpour asked her if she was excited. "Not really," came the reply. "Everybody has babies." Margaret Rhodes was close to the Queen. She once told me that when they were very small, they occupied their time playing at being horses. "We were circus horses or riding ponies or anything you like," she said. "But it involved a lot of neighing and cantering and galloping." Through the decades of turmoil and triumph, they remained close. On Sundays, after church when at Windsor, the Queen would visit her cousin in her grace and favour home. They would have a drink and chat about their families. The small circle of people who understand the Queen, and who have supported her, has just lost another significant member. She attended every key royal event for more than 50 years and recorded her experiences in The Final Curtsey, a memoir which was published in 2011. During the war, she worked as a secretary for MI6 and lodged at Buckingham Palace. In her memoir, she recalled going out with the Queen - then Princess Elizabeth - to celebrate VE Day anonymously among the crowds in London. She described the night as "a Cinderella moment in reverse". Mrs Rhodes later served the Queen as one of her bridesmaids at her wedding to the Duke of Edinburgh in 1947. Unlike the Queen, Mrs Rhodes did give interviews. Before the wedding of the Duke and Duchess of Cambridge, she told the BBC the duchess, then known as Kate Middleton, had "been totally accepted by the nation as a future queen" but added "it's just a family wedding". In 2013, when asked about the imminent birth of a royal baby - Prince George - she said she was not "wildly excited" as "everybody has babies". In June 2012, she recalled the Queen's coronation on BBC Radio 4's Desert Island Discs. She said: "We had only just recovered from six or seven years of deprivation and blackouts and rationing - it was like the sun suddenly coming out behind a lot of very dark clouds and I think everybody felt that with a new young Queen, a whole new era was opening up. It was somehow exciting." In later life, Mrs Rhodes served as lady-in-waiting to the Queen Mother for 10 years and was at her bedside when she died in 2002. Mrs Rhodes's husband Denys died in 1981. She is survived by two daughters, Victoria and Annabel, and two sons, Simon and Michael.